The subject of sin and its punishments was central to all of Bosch's art. A famous triptych, The Haywain, contains a progression of sin, from Eden to hell, across its panels. 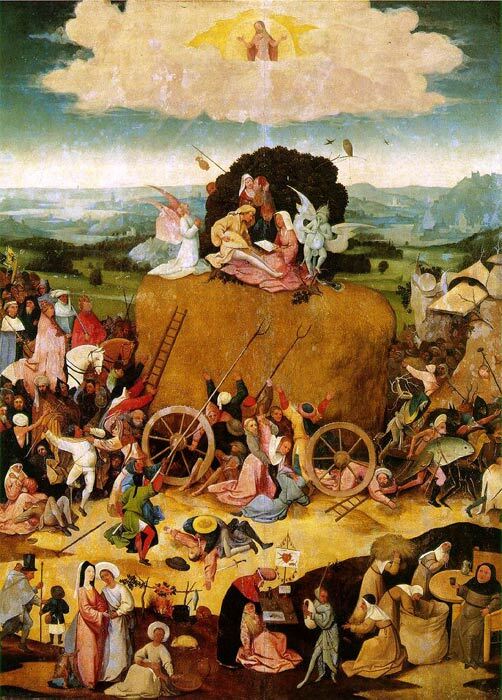 In the central panel sin is represented through the metaphor of a large wagonload of hay for which a greedy world grasps. All the while, the wagon is being pulled by demons towards the right panel - which shows one of Bosch's earliest depictions of hell. SPECIAL NOTE : The painter will make the reproduction as close to the original oil painting as possible. If you want your painting to alter from this likeness, please email us and " Haywain, central panel of the triptych, c.1485-1490 " will be reproduced according to your special requirements.